Adjacent to upper Sycamore Creek, Mazatzal Mts., Maricopa Co., Arizona, USA. September 2013. Ripe fruit observed in Florida Canyon, Sta. Rita Mts., Arizona. July 30, 2013. 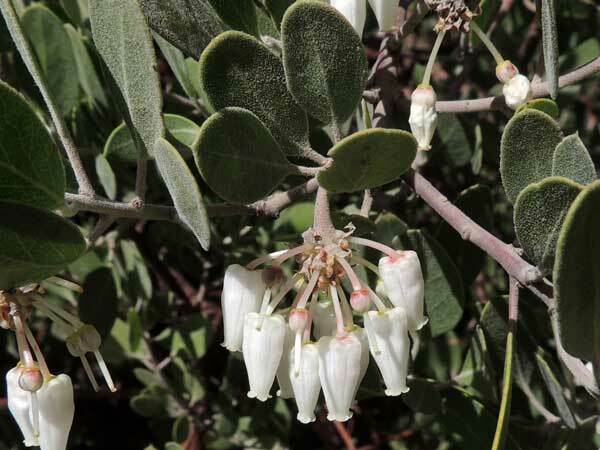 SHRUB: Evergreen shrub up to 3 m tall. Woody branches with smooth red bark. 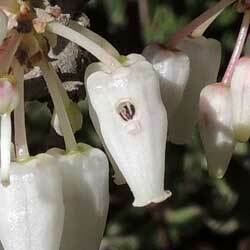 FLOWERS: Groups of pendulous, urn-shaped flowers are white or pale pink. LEAVES: Leaves are simple, smooth-margined, alternate. Young leaves covered with short hairs that get rubbed off with age. RANGE: Distributed mostly in chaparral and piñon-juniper habitats but also on drier soils within sycamore woodlands. 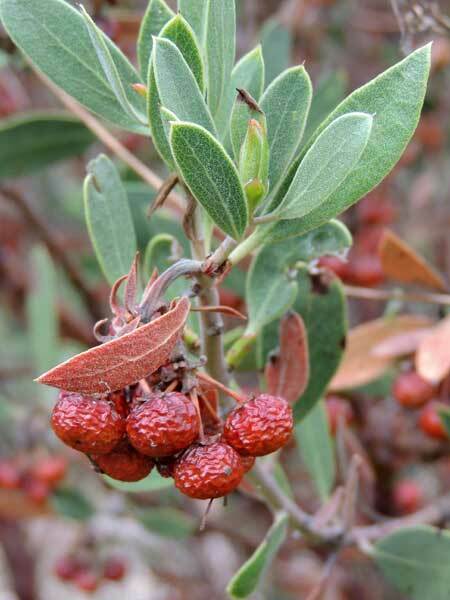 FRUIT: Spherical, orange-red berries with several seeds. UNARMED. However, the intricate branches are very stiff and readily repel penetration. This flower has a neat little hole cut into the side of the urn-shaped corolla. A bee made it to get at the nectar in the base. The tongue-like mouthparts of many bees are simply not long enough to reach into the open top. By robbing the nectar this way the bees are bypassing the pollination mechanism.